At the beginning of The Tale of Two Towns you have to select a town to live in. Your town choice is not permanent. You can change your home town once per season! Each farm has different specialties and can be expanded by Eilene. You can see the expansion size of both farms in the bookshelf of your current farmhouse. The option to move towns is available each season from the 23rd to the 30th. If you choose to move towns, talk to the mayor of the town you currently are living in. 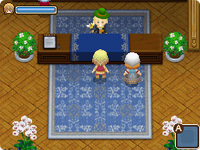 Rudger or Ina have to be working behind the counter at the Town Hall in order to give you the option to move. Rudger does not work at the Bluebell Town Hall on Mondays and Ina does not work at the Konohana Town Hall on Thursdays. The weather can't be stormy on the day of your move. You will need to pay 3000 G to move towns. After confirming with the mayor that you want to move, you will be greeted by the other town's mayor at your new house. You will then be prompted to go to bed and given the chance to save your game. Once you save, you can't move back to your old town until the 23rd of the next season. All board requests you have accepted will be cancelled once the move has been completed. Moving FROM Konohana Town TO Bluebell Town: All of your animals will move with you to the larger, animal-based Bluebell Farm. Moving FROM Bluebell Town TO Konohana Town: Since the Konohana farm is much smaller animal-wise, you will only be able to bring 4 livestock animals and 2 chickens. Rudger will ask you to select which animals you would like to bring with you on the move. You can't select pregnant animals. The remaining animals that you leave behind will be transported away temporarily until you move back to Bluebell Town. You won't see them on your Bluebell farm. You can not sell your "frozen" animals, harvest the products from them, breed them, or swap them out with the animals you selected for your Konohana move. The animals will be returned to your farm automatically if you move back to Bluebell Town. You cannot move of you have any of your animals at Jessica's for breeding purposes. You will have to wait until Jessica returns your animals. If you have a child and are going to move to a town where the farmhouse has not been expanded to accommodate a child, you will have to pay a 1,500,000 G fee when moving for the necessary house expansion. You can not move if you have an active pregnancy. Even though you no longer live there, you can still go back to the other farm to utilize its resources. 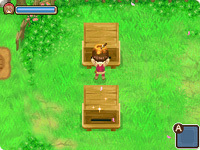 You can grow crops on the other farm, use its maker machines, and harvest honey (Bluebell) or harvest fish (Konohana). You just have to travel over to the other farm. You can not enter the interior of your old farmhouse. The front door of the house will be locked unless you are living there.